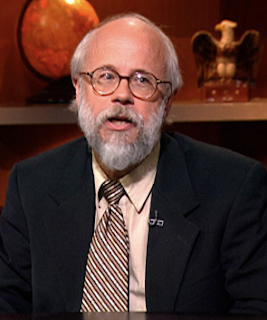 Our next loon, Michael Behe, is a prime example of what can happen when loonery disguises itself as real science. Behe is one of the most ardent and influential creationist out there; covered in more detail here. Behe himself claims to accept (for instance) common descent and an old (13+ Billion years) universe. However evidence shows that he is a straightforward creationist. He consistently argues that his purported evidence that evolutionary theory does not work is automatically evidence for ID. The shifting of goalposts is obvious when he tries to argue that his opponents are inconsistent in arguing that ID is unfalisifiable (e.g. Coyne) and empirically refuted (e.g. Doolittle). In refusing to admit that Doolittle’s experiments - which falsified his specific predictions concerning blood clotting - were a falsification of the testable claims he forwarded with respect to irreducible complexity, Behe spectacularly demonstrates that Coyne is right to deem ID unfalsifiable (insofar as its supporters continuously change the goalposts). Behe is also a religious apologist in general, serving as an “expert witness” for several religion related court cases. Diagnosis: Strongly under the spell of confirmation bias, dishonest and a crackpot. As perhaps the leading creationist today, Behe is very influential and dangerous.